Precision felt-tip eyeliner. 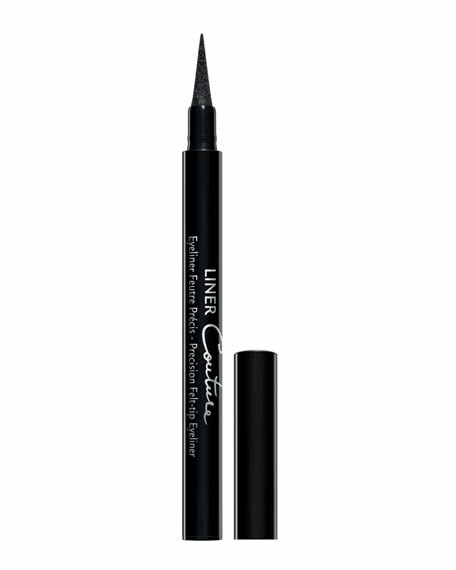 As the essential ally for captivating eyes, the new Liner Couture dresses the eyelids in ultimate sophistication. Whether you want a subtle trace along the lash line or a more intense and glamorous line, its ultra-precise felt-tip lead never gets it wrong. Available in Black and Brown. Since the tip of the liner needs to remain moist, we suggest you store it tip down in a cup or other container. Press down firmly on the tip of the liner against the back of your hand to ensure a smooth flow of product. Nicolas Degennes reinvents kajal, the rich black eyeliner used by the women of India and Asia for thousands of years to enhance the enchanting beauty of the eyes. Magic Kajal's creamy texture combined with an intense black pigments glides on smooth and stays put. Pencil sharpener included.